There are separate areas designed for literally every age group, from babies up to age 21. 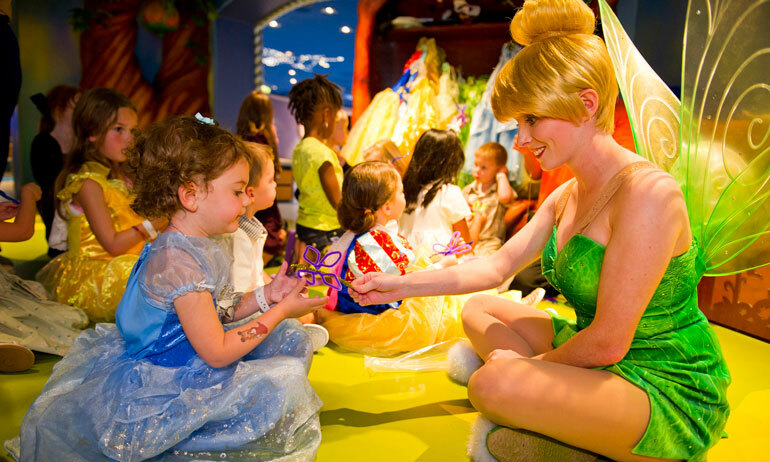 Tots can head to the nursery to play, and older children can dress up in costumes or meet the princesses — or just about any other Disney character. Space and science fans can do experiments at the interactive science lab (on Disney Magic and Disney Wonder) and play on computers. 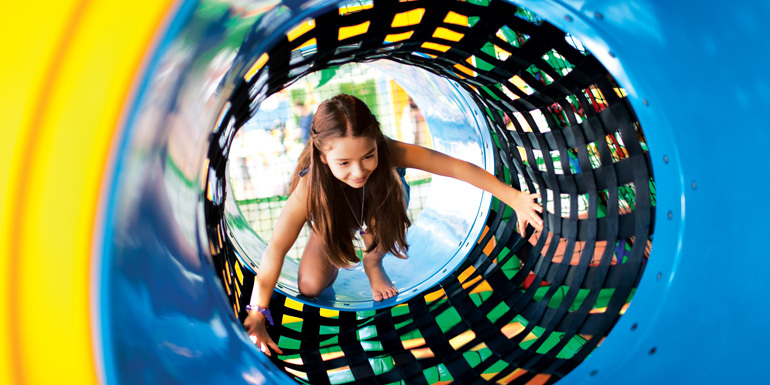 Castaway Cay: The amazing kids’ facilities extend to the line’s private island, where you’ll find not only babysitting services and supervised activities for teens and tweens, but also child-size bikes for rent and a water park for toddlers. Family-Friendly Staterooms: Disney doesn’t disappoint with its oversized staterooms, ample storage, and split baths with separate sinks that allow multiple kids to brush their teeth and wash up at the same time. 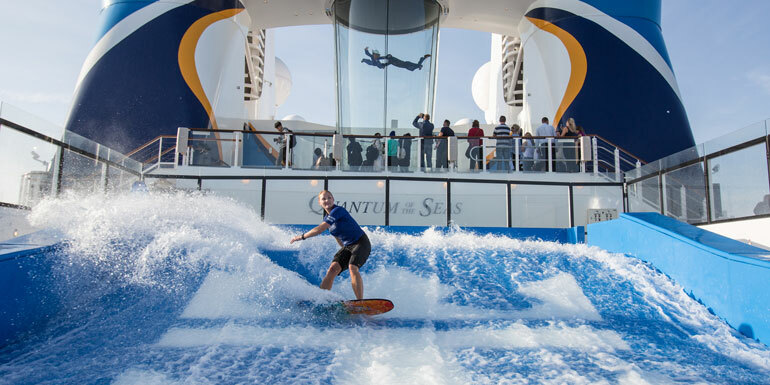 With more onboard action than any other line (picture surfing simulators and zip lines), kids of all ages will be more than entertained. The line’s partnership with DreamWorks means that onboard movies and character visits include “Shrek” and the animals from “Madagascar.” Parents of teenagers, take note: Your kids will love hanging out at Fuel Night Club, a teen-only venue. Great Activities: Active families can try out the FlowRider® surf simulator, rock-climbing walls, carousel, ice skating rink, and zip line. Older kids will want to take in a Broadway-style show, such as “Chicago” or “Hairspray” — a perfect way to spend time with Grandma or the ’rents. On this kid-friendly cruise line, children can decorate cupcakes, make pizza, compete in family game shows or charades, and even attend a circus workshop, which teaches the art of plate spinning and stilt walking. Nickelodeon Partnership: Aboard five ships (Epic, Jewel, Gem, Breakaway, and Getaway), kids can go to a character breakfast — in their pajamas. There are also character meetups, crafts, and Dora’s Dance Party. Emphasis on Sports: Forget shuffleboard — bowling, soccer, and dodge ball are just a few of the offerings for teens. Kids can also spend time on the newer ships’ water slides. 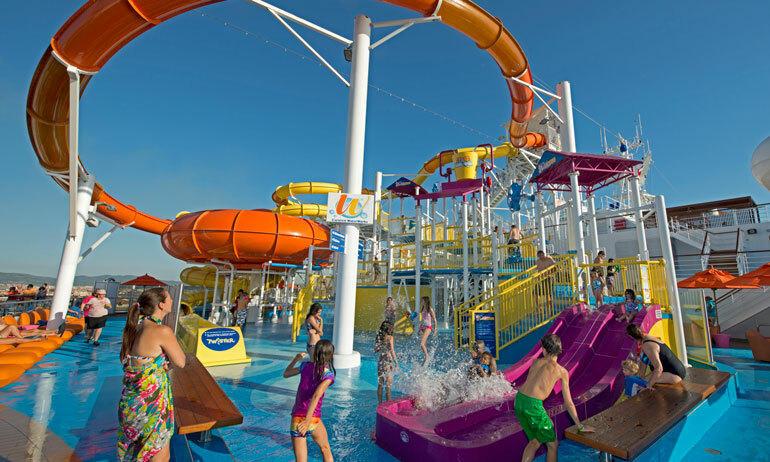 Decks are filled with activities, and pools are topped with the line’s Twister water slide, as well as “splash zones” for the littlest cruisers. The outdoor play areas feature mini-basketball hoops and jungle gyms, and the indoor game rooms offer the latest video and arcade games. Clubs: At Camp Carnival, activities are divided into three groups: ages 2 to 5, 6 to 8, and 9 to 11. At night, the club offers Night Owls, so kids get to stay up late while their parents go out. Older kids have their own programming, too: If your kid is 12 to 14, he or she should head to Circle C, which features a dance floor with plasma screens displaying movies and videos, a jukebox, gaming pods, and more. Club O2, geared to 15- to 17-year-olds, also offers a long list of activities. Food: Expanded kids’ menus include a daily special, and older kids can grab dinner poolside at the 24-hour pizzeria or the grill, and pick up soft serve anytime. Through the Bottomless Bubbles Soda Card, kids have access to unlimited sodas and juices ($4.50 per day for 17 and under). Celebrity caters to families cruising with kids by offering supervised activities geared to six age groups (from 3 to 17). 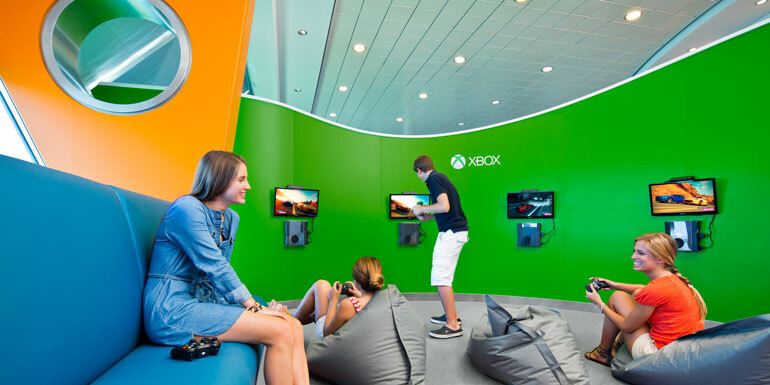 Older kids will spend hours in Xbox-themed areas, teen photo buffs can use video cameras to capture their vacations, and kids can compete in music-themed trivia contests. There are also Junior Olympics with diving and free-throw competitions. Teen Spa: At YSpa, kids ages 13 to 17 get the run of the place, whether they want to hang or book a massage or facial. Parents are invited in for mother-daughter or father-son massages. Healthy Focus: Nerdel, a life-size character, entertains kids about making good food choices — and finding time for physical activity — with live performances. 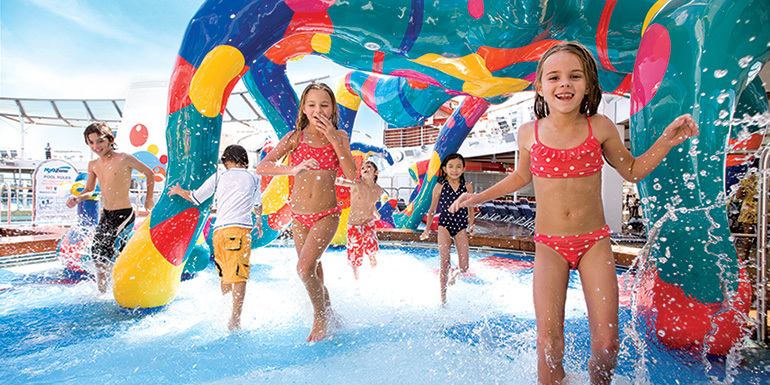 Which line do you recommend for new cruisers traveling with little ones in tow?